Almost daily I get a message on my Instagram from someone interested in buying their first film camera, and asking me what is the best film camera for a beginner? It’s an important question and one can often get overwhelmed with the flurry of responses posting in an avid film photography forum or facebook group. I have my own opinions to the question, but I decided to scrub the analog forums and gather some actual data about the best film camera for beginners so you don’t have to. Keep in mind this is not a list compiled by an intern for a pop culture website the morning after a certain celebrity revealed their Contax T2 on a late night talk show. I loaded up a fresh spreadsheet, hit the forums, and documented over 300 camera mentions from 200 different photographers who answered the question - What is the best film camera for beginners? There are several ways to look at the data about the best film cameras for beginners, most want to know the actual best camera specifically, but thats like asking someone - what is the best watch? Stay with me, as I said there are a few ways to look at the data. Considering there are over 25,000 different film cameras to choose from, I think it’s best to take a step back and look at the cumulative reputation of a camera series. So below you will find the best film cameras for beginners ranked by cameras series, led by the most popular model among that series. The most commonly recommended best film camera for beginners within the most recommended camera series was the Nikon FM2. Additionally the Nikon FM, FE, & FE2 cameras were highly recommended making the Nikon FM/FE series the most suggested film cameras for beginners. When the data showed the the Nikon FM2 highly ranked for beginners I was a bit surprised. What surprised me was that I know this camera as an excellent camera for professionals. Both are true indeed, the Nikon FM2 was built to last, and with one of the longest production runs in camera history (19 Years) there are plenty of them out there to buy. Side note, think about that for a minute, a 19 year production run, that’s how relevant and capable this camera was. It would be the equivalent of Apple not releasing the iPhone 2 until 2026, or the iPhone X being produced until 2036. The Nikon FM2 is around the 2nd most expensive camera on this list, I think the FM2 being one of the most mentioned best film camera for beginners spawns from the idea that it’s capable of not only being your first camera, but also your last. A true work of art that will last a lifetime. I once heard a story about a guy riding solo on a motorbike trip through Europe, one day his bike broke down and he used his Nikon FM2 as a hammer and smacked something back into place that needed a good smacking. He rode onward with a working bike and a working camera. My personal recommendation between these cameras is the Nikon FM. With the all-mechanical shutter of the Nikon FM your camera will always work even if your batteries [for the meter] do not. The FM2 is a little better a camera with some significant upgrades such as a 1/4000th of a second top shutter speed, but you don’t need this, especially if you are a beginner. Stick to the Nikon FM for half the price. Tied for first place with Nikon was the Olympus OM Series, with the Olympus OM-1 being the model mentioned the most as the best film camera for beginners. The Olympus OM-1 was touted as compact and lightweight upon its release in 1972, a time when heavy and bulky SLRs were standard. Mr. Yoshihisa Maitani led the design team for the OM-1 and he took large inspiration form the Leica M series of rangefinders. In fact with a small lens on the Olympus OM-1 the size is comparable to a Leica M3 setup, a true innovation in compact SLR design. Today the OM-1 remains one of the smallest SLR cameras ever made, similar in size to the Pentax MV and Nikon EM. The OM-1 has a built-in meter operated by batteries to tell you what settings are required for proper exposure. The mechanics of the camera themselves are mechanical meaning it will operate at all shutter speeds without a battery. One thing Olympus is known for is its large selection of lenses and their compactness. The OM 100mm f2.8 is the smallest SLR 100mm lens that I have ever seen. Buy this camera with an OM G.ZUIKO 50mm f1.8 and a roll of film and you are ready to start shooting. This will be a capable setup for years. 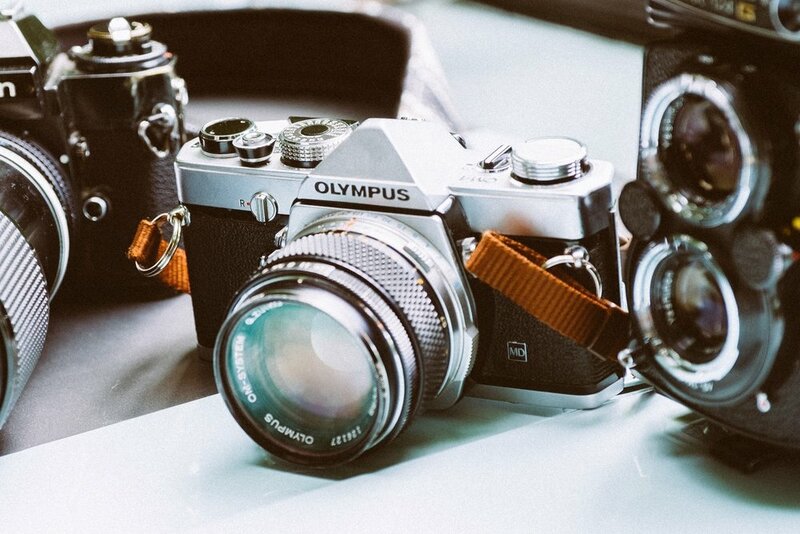 I agree with the recommendation of the Olympus OM-1 but if you want to start shooting with more assistance, go for the OM-2 which has automatic shutter speed (if you set it), then you just choose the aperture, focus, and shoot. And if you can’t afford around 100+ USD go for the Olympus OM-10, it’s a cheaper model at about half the cost and will still give you great results of course. The Canon AE-1 Program is one of the most well known film camera models of all time. It received the most mentions of best film cameras for beginners within the highly suggested Canon A series. Other cameras making the list were its predecessor the Canon AE-1, and the Canon A-1 and Canon AT-1, all highly capable and affordable for your first film camera purchase. The highlight feature of the Canon AE-1 Program was the “program”. Program mode enabled full exposure automation, just focus and shoot. The aperture and shutter speed are chosen automatically, which was a huge leap forward in camera technology at the time. Personally I like the looks at the Canon AT-1. And the lack of any automatic features makes it a good way to dive into photography and force yourself to learn the basic principles of exposure. If you want one of these Canons as your first camera and aren’t ready to go head first, try the automation of the AE-1 Program, or the even more automated Canon A-1. True Nikon analog fans will drool at the sight of your Nikon F3! It is another wonderful film camera that will last a lifetime should you not drop it off any cliffs. I’m surprised it was mentioned as often as it was with an average price of over 200 USD. Then again some first-timers are dropping big bucks for premium compact cult cameras like the Contax T2 at over 700 USD. Also highly recommended in this series was the Nikon F and Nikon F2. Nikon has one of the largest selection of manual focus lenses among any brand and it will be easy for you to find the lens you want at a decent price as you refine your skills. I suggest the Nikon F, it has a design language akin to the Nikon S rangefinder line and I find the interchangeable finders a nice feature. The finder without a flash mount on top is particularly attractive! The Pentax K1000 was the single most mentioned model for the best film cameras for beginners, suggested by about 1 in 10 photographers. 1 in 10 doesn’t sound like much, but keep in mind people could have suggested any camera model from over 25,000 different options and 10% of them said the same thing. The reason it’s 5th on the list is because I ranked these by camera series or model family. The Pentax K1000 was the only model mentioned from its series and compared to the cumulative mentions of other camera series, this came 5th. Again all of these are among the best film cameras for beginners, any one on the list can work for you. There are many other cameras that offer the same benefits of the Pentax K1000 for a little less or even half the price. Also the Pentax K1000 is among the largest cameras on this list if size means anything to you. I find the Pentax MX much more attractive. I wouldn’t suggest paying the popularity-tax on the K1000. Pick another one from the list. Of course if you find a good deal or are gifted one of these, take it, it will be an excellent camera for your first. Truthfully the budget Minolta X series of cameras is the only series on this list that I do not have any personal experience with, I’ve only used the top-of-the-line Minolta XD-11. In doing research for this article it was very apparent that there are a lot Minolta X fans out there and for good reason. With the option of full exposure automation in a good looking camera for 30 to 100 USD (often with a lens), you can’t go wrong with this as your first time buy. The most mentioned in this series was the Minolta X-700, followed by the Minolta X-300 and Minolta X-500. Another benefit of Minolta it that of has one of the most affordable pancake lenses, the Rokkor-X 45mm f/2. Pancake lenses for SLRs are typically 40 or 45mm at f/2.8, and this one has a slight advantage at f/2. You could buy 10 or 20 of the Minolta Rokkor-X 45mm f/2 pancakes lenses for the same price as one Olympus OM 40mm f/2 pancake. If you want a small kit that allows you to learn the basics or shoot automatically and at an affordable price the Minolta X line is a good option. Any of these will do, though the Minolta X-700 seems to be the most available. The Minolta SR-T 101 was first produced in 1966 and continued for a decade with slight variations. It’s one of those cameras you could call a tank, a bit brutalist in design and built-to-last. The Minolta SR-T 101 has everything you need to expose a picture and not much else. The body has a built-in meter and shutter speed selector at its forefront, with a subtle self timer and depth of field preview button. There were various mentions across the SR-T line with the SR-T 101 being the most common. This is one of those cameras that you are likely to find at any flea market or grandmas attic, and it has got that true retro-look if that’s what you’re after. It’s a little big for my taste! I prefer the design and size of SLR cameras first introduced between 1972 and 1980. But if you like it, the manual controls are great for a beginner ready to learn. Last on the list is Pentax. Pentax brand cameras were actually the second most mentioned brand by over 200 photographers in suggesting the best film cameras for beginners. The mentions of Pentax series cameras ranged widely between the Pentax M, K, P, and Spotmatic series, putting the spread of statistics all throughout the brand, with Pentax M series making the bottom of the list yet still in the top 6. This means that in general Pentax is a great brand of film cameras for beginners. I was happy to see the Pentax MX on the list as it is one of my favorite SLRs of all time, right behind the Pentax LX at my most favored. The Pentax MX is the smallest camera on this list and is among the average price of around 100 USD. It has some nice features that are not often found on affordable cameras such as a depth of field preview button and shutter lock. Second most mentioned of the M line was the Pentax ME, a very similar camera with an Aperture Priority only mode. The Pentax MX is fully mechanical minus the expected battery-powered meter, and can be shot in nearly any temperate and operate on all speeds without any batteries. The meter inside is particularly useful as it can be used in the dark. It has a set of 5 LEDs vertically aligned with three colors. A single centered green light for perfect exposure, two yellow lights for one stop under or one stop over exposed, and two red lights for 2 or more stops over or under exposed. Many cameras such as cameras from the 1970s and earlier operate on a match needle type exposure which can usually not be seen in the dark - making it unfortunately useless in while shooting in those conditions. If you’re serious about learning the fundamentals of photography get the all-manual Pentax MX (much better than the K1000 in my opinion), if you want a camera with some automation go for the Pentax ME. Ready to Buy Your First Film Camera? Check out my friends at Kamerastore.com, they have over 4,000 items and list around 20 new items each day. If you are an experienced film photographer and here out of curiosity, please comment below with any advice for those beginners beginner film photographers reading this article.